1. If I buy a PH-TC14PE now, will it come with mounting brackets that support the AM4 socket? Or do I have to request them seperately from support or something? The website doesn't list AM4 at all, but I read that Phanteks supports AM4 in general, right? 2. Can I use the included fan clips to replace the stock fans with other square frame 140mm fans? Thinking a pair of PH-F140MP's, mainly because they're black. 3. How is the RAM clearance of the PH-TC14PE? Would it fit with two G.Skill Trident Z RAM sticks on an ASUS Crosshair VII Hero borad? All new PH-TC14PE coolers have AM4 mount. Trident Z are 44mm tall so are about 39mm above top of CPU. Bottom fins are 45mm above CPU. But to fit a 140mm fan over Trident Z RAM your case will need 179mm of CPU clearance. It's reassuring to hear that the PH-TC14PE includes an AM4 mount. You guys should consider updating the product page to inform potential buyers in the future. I figured as much with the fans after checking the specs on the website, but the white frame kinda ruins it for me, as I'm going with an all black build... Is it possible to remove the impeller and paint the frame? Or would it destroy a seal on the bearing or something? Just so you know, I do not work for Phanteks. I do some testing and reviewing and have used a lot of Phanteks products because I've found them to be good. I don't think the impeller can be removed but you could still paint the fans. What I've found to be best is the vinyl/leather upholstery dye. It's thinner than paint but covers better. I think I would try using a small brush or dauber and black dye. Try finding a auto detailing shop that dyes seats and try to get them to sell you a litle of their black dye. Enthoo Pro is a good case. Same skeleton case as Enthoo Luxe with different front and top. But the 200mm front fan is garbage .. the only product from Phanteks that is. A single 140mm moves more air. I know the website says case comes with PH-F140SP, but the 140mm fan that case comes with has a PH-F140SP housing and 1200rpm motor with a PH-F140MP impeller. Same impeller as used on PH-F140HP_II and PH-F140MP PH-F140MP comes in all black 1600rpm and PWM. I suggest you buy 2x or maybe 3x PH-F140MP fans for front intakes and maybe a bottom intake.. they are all black. I like bottom intake with PSU shroud removed to push cool air up into GPU, but if you are not using a powerful gaming GPU you won't need bottom intake. I use a caster base too, but that's another story. I suggest you remove all PCIe back slot covers to create a nice exhaust vent around GPU. This greatly improves front to back airflow around GPU and lowers temps nicely. 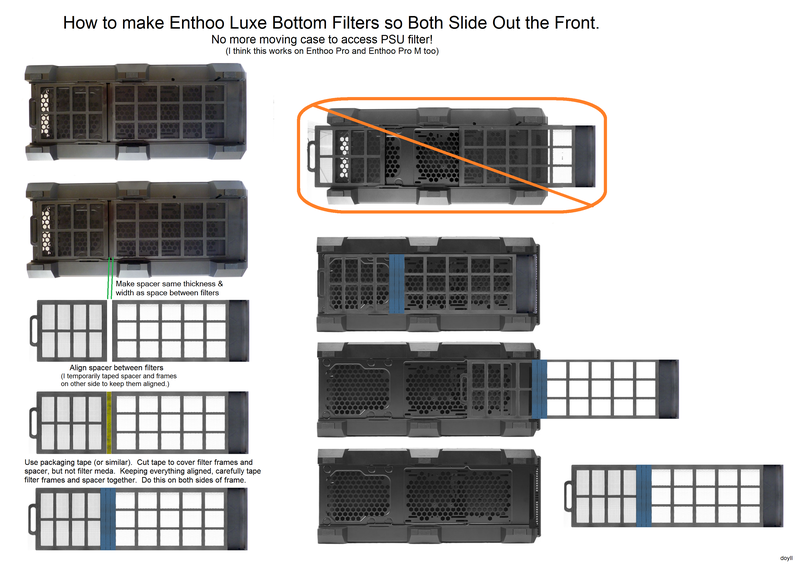 Another nice little trick on Enthoo Luxe and Enthoo Pro is the 2 bottom filters can be attached together as instructed in link below so they slide out the front as one long filter. Don't need to move case anymore to pull and clean bottom filters. Last edited by doyll; 08-23-2018 at 02:51 AM. The dust filter mod is glorious, I will 100% be doing that. Shame Phanteks didn't think of this themselves. If I was to order PH-TC12DX CPU COOLER - BLACK, it will come with an AM4 bracket without me needing to request through support? All coolers made in last year come with AM4 mount included.